The rest of our time in Panama city was spent sightseeing by foot, with plenty of pit-stops in places with air-condition (and often beer). Casco Viejo has a lot of beautiful buildings, but a lot of them are empty and in bad condition. Foreign investors are now restoring some of them, building hotels, jazz clubs etc. We visited the ruins of the church and convent of Santo Domingo with the reconstructed 15 meter arch, Arco Chato. Legend says that this arch was the reason why the US decided to build the canal through Panama instead of Nicaragua with it’s volcanoes and possible earthquakes. 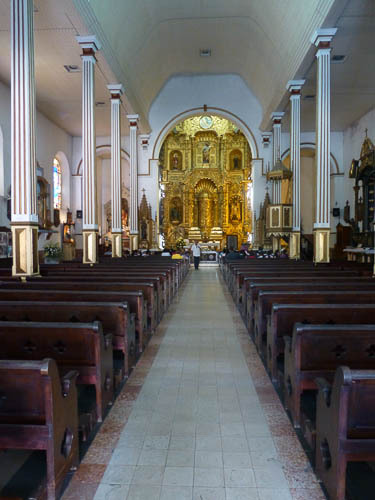 We stopped by the cathedral (build between 1688-1794), the church of San Jose with the famous Altar de oro (a massive baroque carved alter covered in gold), the fish marked and walked down the pedestrian street La Peatonal. On our last evening in the city we ended up back at our favorite pub, La Rana Dorada, where we met an American-Bulgarian couple, a Finnish couple and an american girl living in Panama. We introduced the Finnish couple to our guide, Karloz, so that they could go on a city tour with him the next day. We went for dinner at Monolo caracol, a great restaurant with no menu. Great small dishes just kept coming. Delicious!